Matheran, with its dense forest cover is a walker’s paradise. The trails are generally clean, the air crisp and cool. Of the 33 view points, rightly called the King of Points, Panorama Point is about 5 kms north of the town centre. 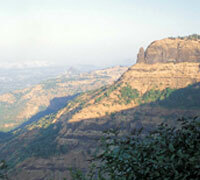 It commands a panoramic view of the Sahyadri Range and gives a bird’s eye view of Neral town. From here there is the awesome sight of the toy train as it rounds the curve below the Point. Watching the sunrise from here is an unforgettable experience. Nearby is Mount Barry, named after Dr. Andrew Barry. It is one of the highest places at Matheran. Between Mount Barry and Panorama Point lies the large plateau of Governor’s Hill. Garbut Point provides a good view of the main trunk of Matheran to the west. From Alexander Point, the Chowk Valley, the river Ulhas and Palasdari with its lake are visible. From Ram Baug Point one can see Khandala and Karjat. Chowk Point has stunning views of Karnala Fort, Panvel, Vishalghad and Prabal Fort. While Panorama Point offers a dramatic glimpse of the sunrise, Porcupine Point is noted for its sunsets. A remarkable view of the Cathedral Rocks can be seen from here, while Hart Point offers a superb view of Mumbai at night. Monkey Point is a good place to be at to see the Malang Range. Louisa Point boasts of the largest plateau of all the Points, and provides a good view of the ruins of Prabal Fort. During the monsoon a spectacular waterfall springs down the hill. The Echo Point, as the name suggests, one’s voice can be heard booming back across the valleys. From King Edward Point there is the sight of the beautiful waterfall overflowing from Charlotte Lake. 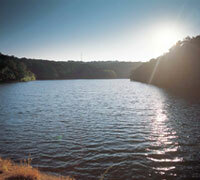 Nestling in a picturesque valley is Charlotte Lake, Matheran’s main reservoir of drinking water. The lake has a dam at one end and the Pisarnath Temple, the tutelary deity of Matheran at the other. You can walk to most of these view points or alternatively take a horse or a rickshaw. Horses can be hired from virtually everywhere at Matheran for about Rs. 100-150 per hour. You will be charged for the accompanying rider also. Package ride of 7 points or 12 points can be negotiated at hourly basis of Rs. 125 – 200. The rate per rickshaw for view points vary between Rs. 300 - 350. However one has to pay much higher during the high season. Make sure to fix the rate in advance and specify whether it is per hour or per package round. Small it might be, but Matheran boasts of a regular racecourse - Olympia, where the horses are put through their paces to the delight of one and all. In the oval of Olympia, cricket matches are staged with teams coming from far and wide to participate in the customary tournaments. Another attraction at Matheran is the Malet Spring, from where in yesteryears only the British drew their drinking water. Today, after the coming of piped water, the town receives its supply from the Filter House, which is situated at the highest point at Matheran, the Rugby Plateau. Matheran also draws many a naturalist, as its Fauna includes the Jungle Cat, Barking Deer, Porcupine, Hare and much more. The hill is also home to the state animal of Maharashtra, the Indian Giant Squirrel. In the flowering season flocks of exotic Butterflies and Moths can be seen flitting about. Given the variety of bird life at Matheran lot of bird-watchers are drawn to the hill. Of the Flora the woods are laden with the Jambul, Parjamb, Anjan, Pisa and Gela, to name a few of the larger trees. In addition to the Jambul, the wild fruit to be had are the Karvand, Alu, Kokum, Mango and Jackfruit. In shaded and moist spots in the jungle are varied species of Fern, Mosses, Fungi and the like. And then, a careful search in the forest will yield orchids of a fair variety. With the first rains the mushroom hunters are out for the wild variety, Alembi, to the locals.